Warning: Reading this article may diminish your enjoyment of some photographs you view in the future because you will start to observe a flaw that would previously have gone unnoticed. A camera lens has many different attributes. There is focal length, zoom, minimum/maximum aperture, sharpness, and chromatic aberration… and that’s just off the top of my head. Lens manufacturers only tell the basics like focal lengths and apertures. Third party reviews will often get in to sharpness and “fringing”. But most of these reviews are concentrate on subjects that are in focus. They usually ignore those parts of the photograph that are outside the range of “acceptable sharpness” since they’re assumed to be unimportant. After, all, if they important, they would be in focus. Besides, it’s all blurry anyway, right? Not always. A blurry background is not necessarily un-sharp. At first read, this seems like a contradiction in terms. How can something that is “blurry” be at the same time “sharp”? Why depends on the reason something is blurry. When something is out of focus, the light rays coming through the lens are projected on the film/sensor in a circular area instead of at a single point. If the rays are dispersed evenly, you get a circle like that on the left. If the rays are concentrated towards the center, you get a circle like that on the right. In the center is an example of a perfect in-focus point. You’ll note that the circle on the left, though blurred, is still sharp on the edges. An image is nothing more than numerous points of light, so let’s add some more blurry points. 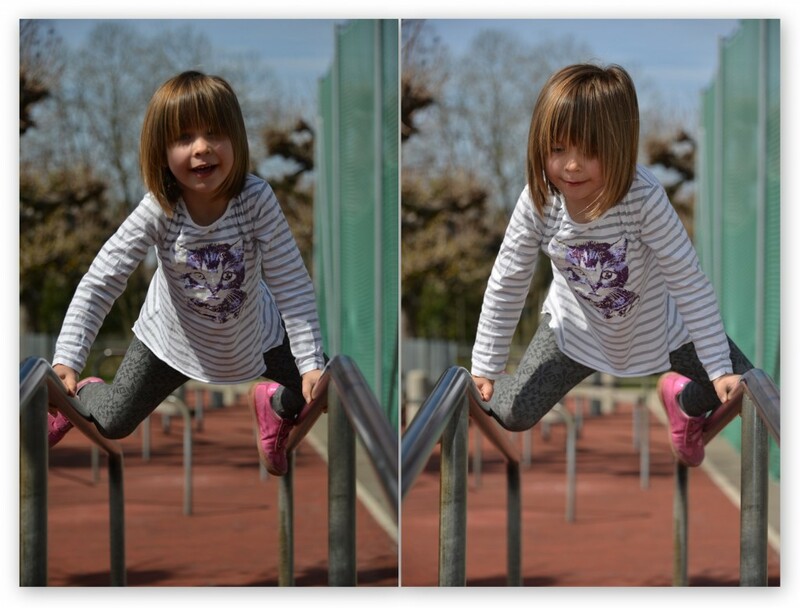 Already you can see that the image on the left is not the smooth gradient that you would expect from a blurred image. One could argue, however, that this is due to the high contrast pattern being demonstrated and that if it was more uniform, as in a normal photograph, then the blur would be better. Okay, that is better, but what happens if you have a single point that is much brighter than the others? At first glance everything looks okay, but a second look shows an obvious circle in the left image while the right one is still blurry. Of course, this is a contrived example and would never occur in real life, right? 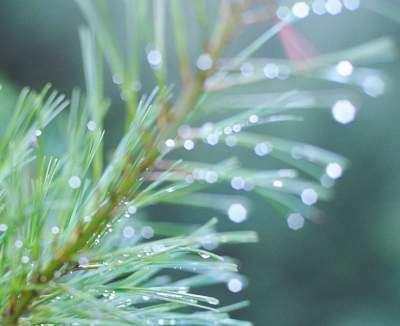 The above picture is a portion of a larger image I took of a pine branch just after a rain shower. The drops of water on the needles catch the sunlight and make very bright points of light that get rendered in out-of-focus areas as sharp-edge circles. They’re not perfect circles because the diaphragm of the lens is not a perfect circle; it has seven straight blades, as you can easily count. The rendering of out-of-focus points by a camera lens is called “bokeh” and it is commonly ignored by lens users and lens designers for the simple reason that “good bokeh” (the images on the right) is created by imperfect lenses, or lenses that exhibit “spherical aberration”. A technically perfect lens (corrected spherical aberration) will render points evenly, thus causing the images on the left. Most lenses will exhibit this “neutral” bokeh. This quality is of special importance to portrait photographers who almost always want soft backgrounds. In their case, any sharpness will detract from their subjects and so many of these photographers demand lenses with uncorrected spherical aberration for their work. Now… If the images on the right are examples of “good bokeh” and the images on the left are examples of “neutral bokeh”, then what would be “bad bokeh”? In this case (over-corrected spherical aberration), instead of getting a solid circle, you would get a ring. Unfortunately, the nature of physics says that if an out-of-focus point in the background exhibits good bokeh, then an out-of-focus point in the foreground will exhibit bad bokeh, and vice versa. That is why professional portrait lenses like the Nikkor 105/135 DC (“defocus control”) allow adjustment of the amount of spherical aberration correction in both the forward and backward directions from center. I own a Nikkor 105DC and it is an absolutely beautiful lens; slow to focus but sharp and beautiful! Now that you know about Bokeh, though, you’re probably going to start noticing it in photographs you see, including your own. You’re going to be distracted by things that are supposed to be out of focus, and there isn’t anything you can do about it. Still, the distraction would have been there whether you knew what was causing it or not, and now that you know what it is, perhaps you can do something about it. If you don’t have or can’t afford a “dc” lens like the above-mentioned Nikkors, things like this can be somewhat corrected with post-processing in Gimp or Photoshop by applying a gaussian blur to these areas, such as what I did here. Sometimes bad things happen and you just have to get the word out. I realize that not every contractor can be Mike Holmes but it’s a horrible feeling when you’ve got someone doing work on your house that turns out to be the kind that Master Mike talks about. To a large degree, there isn’t much you can do about this when it happens other than do your best to let others know about it so that, hopefully, other people don’t suffer through the same. This video is the result of my efforts to that very thing regarding “master carpenter” Terry Bellamy of Higher-Hands Construction. Enjoy! It’s a long-standing “rule of thumb” that f/8 is the sharpest aperture. It’s important to remember, though, that there is exactly one distance from the focal plane that has “perfect sharpness” while distances near are simply “acceptably sharp”. There is no sharp boundary (if you’ll excuse the pun) between that is in focus and what is not but rather a gradual shift from one to the other. With the D800’s exceptional resolution, however, the definition of “near” becomes rather small. 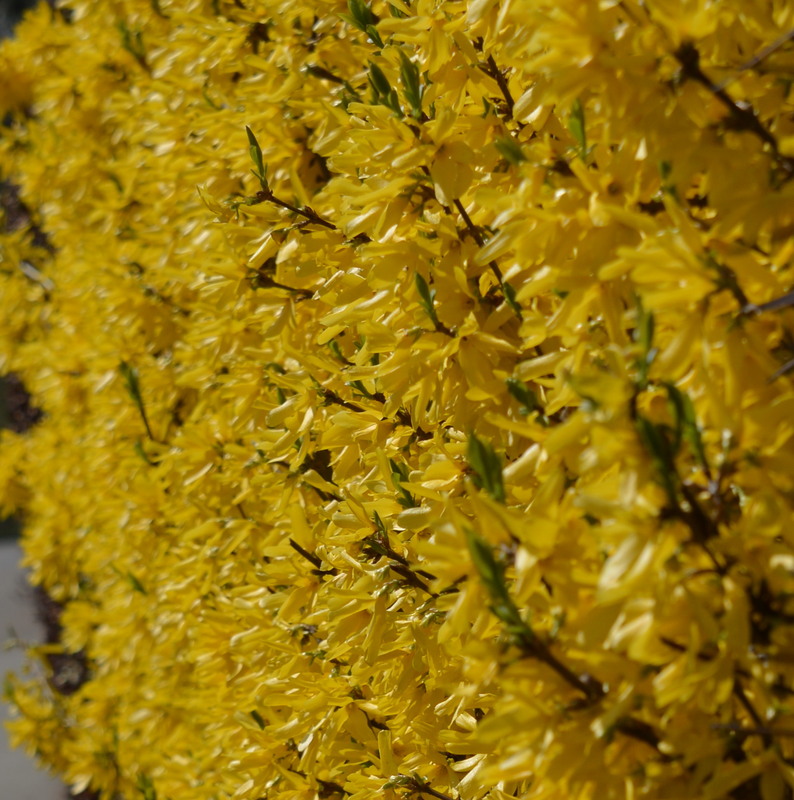 The above image is a hedge in bloom and that was approximately 2 meters (1 meter is equal enough to 1 yard for this comparison) away at its closest and 6 meters away at its farthest. It was shot at f/8 at 68mm and is a full-resolution crop from the center of the image. As you can see from the full-size image, even at f/8, the range of “acceptable sharpness” covered a depth of probably about a ¼ meter (call it 1 foot). Down-scaling by a factor of X will of course increase that range by a factor of X.
There’s been a lot said about the new Nikon D800 and it’s twin, the D800E. There’s nothing but a single letter on the outside to tell them apart and not much on the inside, either, with only the anti-aliasing filter cancelled out. What does an anti-aliasing filter do? It (nearly) eliminates the effect of “moire” patterns caused by fine, repeating detail. See the Wikipedia article for more information. The cost of such a filter is that the resolution is decreased somewhat because the light is “blurred” (high-frequency component is removed) so that it hits more than a single pixel. What this means is that the D800E without the AA filter will be able to produce an image with more detail than it’s brother. However, any fine, repeating patterns will likely cause weird color artifacts. If you’re a nature photographer, such patterns are not common but if you’re going to be photographing anything man-made (including clothes), the lack of an AA filter is going to create problems, problems that are very difficult to remove in post-processing. I’ve ordered a D800 (no-E) for myself because experience has taught me that too much stress on the best possible performance usually comes back to bite you in many other ways. Better to have something that works really well in all situations than something that works perfectly in only a few.